I have decided to have Rami pull this scenery to eliminate any further downloads. All of my custom objects in V4.2 are solid black. . .the original objects were compiled using the FSX_SDK, that always worked equally well for both FSX and P3D. Now however it is apparent that V4.0 and above is a different animal and so FSX compiled scenery objects don't appear to work at all, although default objects seem to be fine. If you have it working in your Sim consider yourself lucky. I apologize for the mess this has become, but I have no other remedies for any problems you might run into. I suggest that those who have texture problems, if they are minimal (1 or 2 homes out in the "boonie"), accept that as it is or delete the scenery. I have supplied all the textures needed for those houses, the addition of those textures fixed my homes. . .I have no idea why it didn't fix the problem for others. Difficult to believe all the difficulties. Aside from my scenery having the fellow with the cell phone and the lady beside him (probably left from the Orbx object file) my scenery looks fine as far as i can determine (P3DV4) - and this is usually not the case. Still interested in seeing a version of Long Lake NY (NY9) if you decide to experiment a bit. In any case it doesn't appear I need to delete KTGI. Last edited by aspen31; April 16th, 2018 at 11:01. I suggest that those who have texture problems, if they are minimal (1 or 2 homes out in the "boonie"), accept that as it is or delete the scenery. I have supplied all the textures needed for those houses, the addition of those textures fixed my homes. . .I have no idea why it didn't fix the problem for others. Hi Ed - after downloading today most of your more recent sceneries, I went through the lengthy process of individually trying their texture sets added to the Tangier scenery, and found two required textures for one of the buildings that weren't previously present. They were 'alt_siding_2_lite.dds' and 'roof.dds' from Millers Field v2. Now just two homes with missing textures, may just be in some of your sceneries I haven't yet downloaded. Very usable now as is, thanks again for this scenery. Your post bothered me greatly, only because here you are half way around the world, flying in P3D_4.2 (just as I am) you have no problems at all apparently and here I am, the developer and as you can see, every one of my custom buildings are black. I considered that after trying various ideas yesterday to correct other problems people were having, that I could have contaminated my version. I deleted my copy and reinstalled from the zipfile that I posted for everyone to download. It made no difference as you can see. I considered that maybe it was because I had not compiled those buildings using the P3D SDK, however if that were the case then none of those 1792 objects would display at all as they are all FSX default objects. Also, the School, which is across the bridge from the airport displays fine and it was compiled the same way all the others were. The obvious reason for black buildings is that they have missing textures, but all the textures are there in the texture folder (obviously, since your buildings are fine). So I'm at a point of total frustration after thinking I finally had this scenery done after years of messing with it off and on. I found another missing texture file ( "ROOFING.dds" ) with the help of P3D's ContentErrors.txt file. and the black buildings are gone. activating the "Enable Content Error Reporting" under Application / General. This will give you an error report ,after shut down your sim ,which you will found in the your documents / Prepar3D v4 Files / ContentErrors.txt. I hope I could explain it understandable with my poor english. Sometimes multiple texture files of the same name will cause black objects. YES!! Thanks Ulrich. 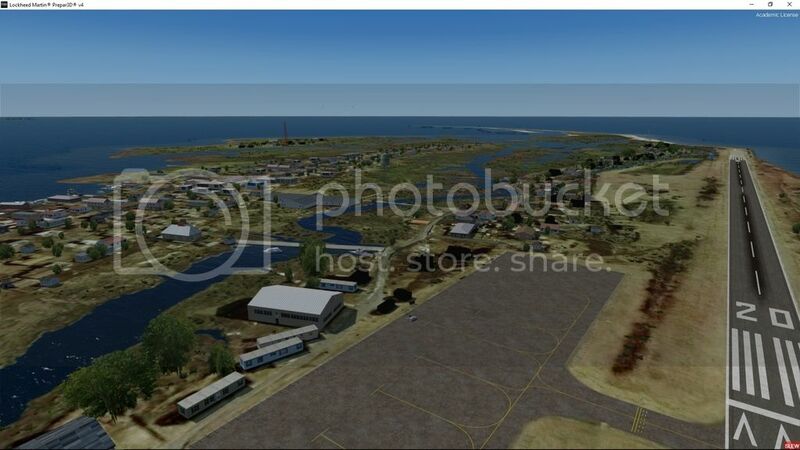 I too now have a completely textured, elevation sorted, fantastic working scenery of Tangier Island. That may be true. I try to name my textures using a scenery specific name e.g. Tangier_roofing.dds instead of just roofing.dds to avoid that. Also there may be default textures with simple names that would conflict. I have been there once and it was a hard bug to crack. I have started over with placing the scenery objects. I stripped everything away that was placed using IS3, deleted everything that I pulled from outside of the Tangier Island scenery folder and then rebuilt the scenery folder adding back only those object bgl's that I wanted to use for the scenery. My problem has been that over time I have built hundreds of custom objects for individual sceneries but they were never consolidated so consequently they were scattered all over the place in various scenery folders and when I built Tangier Island if I wanted a certain house I would just use it based on what showed in the list in IS3, never really knowing where it came from. The "short-term" remedy for that was so obvious that it escaped me completely until yesterday. Place everything I want to use into the Tangier Island scenery and texture folders, go into the Sim and deactivate all other addon scenery except the one I'm working on. Consolidating everything right now would take longer than I have patience for but as I say, for the short term it's a good way to ensure that what's on the screen in the sim is what's coming from the correct folders for Tangier Island and not half a dozen other sceneries. Also, I will say that after placing a hundred or so objects back into the scenery last evening and loading P3D to see the results, the elevation problem (the slight plateau that showed previously) was gone completely and it looked exactly as it does in FSX. That's without touching anything after I became frustrated with the problems that continued to surface elsewhere. So there's another frustrating thing about cross-platform Sims displaying from the exact same scenery folder, but with varying results that can change based on the temperament of the Sim, the heat generated by the graphics card, the air movement in the room the computer is housed in, the time of day, the temperature/humidity index at any given moment and what you happen to be drinking at the time the anomaly displays itself. Thanks for all the efforts and the good work. Remember most of us do this for fun. I think the scenery looks better with beer. Wine makes it a little crrookeeed! I took a look at my content error log and found no errors with TGI in the log. I do not have any of your other sceneries. Running P3Dv4.2 with ORBX.